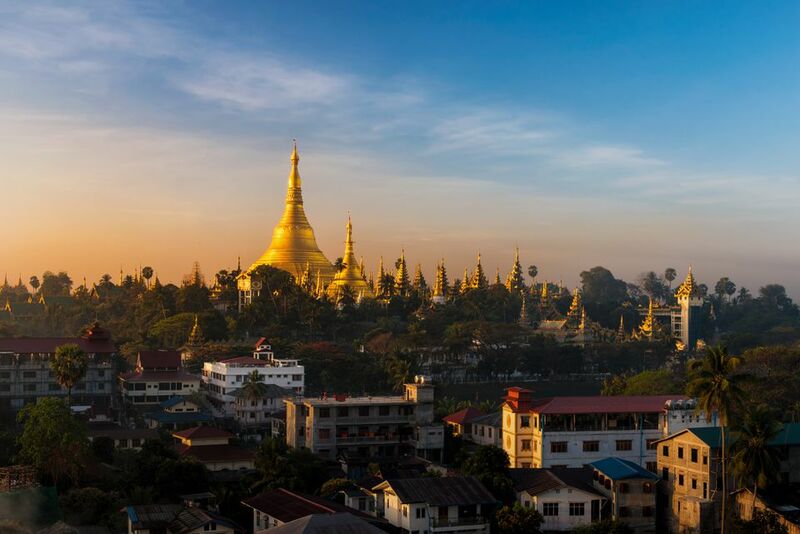 Yangon is Myanmar's largest city and former capital; while government operations have moved to Naypyitaw, Yangon retains its pre-eminence as one of the two international hubs of the country (Mandalay, the former royal capital, is the other). The Mon people of Lower Burma founded the city as Dagon in the 11th century. By the 17th century, King Alaungpaya of Upper Burma conquered Dagon, renaming it Yangon - "end of strife". The British colonial overlords who took over in the 18th century Anglicized the city's name to "Rangoon", a name that would be used outside of Burma for the next 200 years. The city is still Myanmar's center for business, politics, religion, and heritage. You can get a sense of the Yangon's place in history by visiting the sites listed below. The Yangon skyline wouldn't be the same without the Shwedagon Pagoda, the city's most popular heritage and religious site. At over 2,600 years of age, Shwedagon is the oldest pagoda in the world. Also known as the Golden Pagoda, Great Dagon Pagoda, and Shwedagon Zedi Daw, this golden stupa is regarded as the most sacred Buddhist Pagoda, a status granted by the relics of past four Buddhas housed within -- eight strands of hair from Gautama Buddha; the staff of Kakusandha, the 25th Buddha; the water filter of Konagamana, the 26th Buddha; and a piece of the robe of Kassapa. The golden spire is only the most prominent structure in the Shwedagon complex; a proliferation of shrines, pagodas, and stupas have mushroomed around the spire over the centuries, each one a witness to the complexity and passion inherent in Burmese Buddhism. As you are entering one of Myanmar's holiest sites, take a few precautions and follow the simple rules of etiquette. One of two lakes within city limits, Kandawgyi Lake was created to supply clean water to the city during British rule. The lake is man-made and channeled from Inya Lake, the other lake within Yangon. Kandawgyi is a staple backdrop in Burmese commercials and movies, thanks to its scenic location overlooking Shwedagon Pagoda. Visitors can roam the large park surrounding the lake, a carnival-like setting with modern entertainments like video gaming machines and an ice land exhibit where kids need to put on fur coats and boots before getting in. Several hotels are located in the park overlooking the lake and nearby Shwedagon Pagoda. The lake looks awesome at night, as the Pagoda lights up the sky. A jetty leads to a grand barge floating off Kandawgyi Lake's shores, a gilt palace known as Karaweik. The barge is a replica of the former Royal Barge; with no royalty in sight, Karaweik now serves as a floating buffet restaurant and cultural show. The British built Scott Market in 1926, and the interior has largely kept the original colonial design and interior cobblestone lanes. After Burmese independence, the market was renamed after the father of the nation, Bogyoke (General) Aung San (the father of Aung San Suu Kyi). An additional wing was built across Bogyoke Market Road in the 1990s. Then and now, Bogyoke Market serves as Yangon's main marketplace: Over 2,000 shops inside sell gems, clothes, stamps, coins, and tourist souvenirs. Authorized shops sell genuine rubies, jade, and sapphires at relatively cheap prices. You'll find plenty of black market money changers here in Bogyoke Market, too, but the law frowns on patronizing these; have your bucks changed at an authorized money changer instead. There are three important Buddhist pilgrimage sites in Myanmar, and two of them can be found around Yangon. Leaving aside the Mahammuni Pagoda in Mandalay, the Shwedagon Pagoda and Kyaiktiyo Pagoda claim the allegiance of devout Burmese. 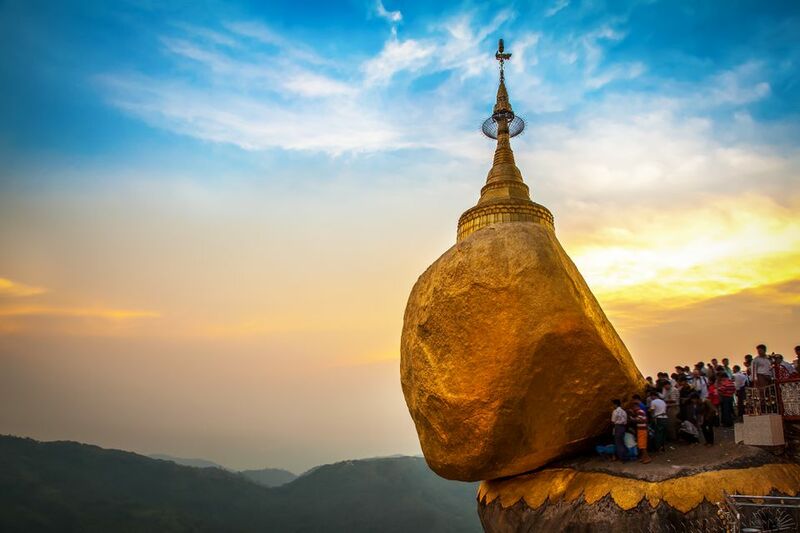 Set a few hours' drive from Yangon, Kyaiktiyo Pagoda looks like no other pagoda you'll ever see in Myanmar: it's a huge, gold-covered rock teetering on a cliff edge on the slopes of Mount Kyaiktiyo. According to Buddhist belief, the rock is kept in place by a strand of Buddha's hair. This gravesite serves as the final resting place for over 6,000 Commonwealth soldiers who fought for the Allied cause in World War II. The immaculately-manicured memorial park is the largest war cemetery in Myanmar, having received remains previously buried in other, less accessible gravesites. A memorial on the site bears the names of 27,000 missing Commonwealth soldiers presumed to have died while serving in Burma. Unlike other parks in Yangon, Taukkyan requires no entrance fee; getting here takes a 45-minute drive from Yangon's city center.